Cultures are best observed from the outside. Sometimes, when you’re in the midst of everything that’s happening, it’s hard to look at it objectively. If you’re part of an organization (especially if you think about training all day) it can be hard to get a sense of how important learning is to the average employee, or how much time those in the organization spend thinking about training. Here are some concrete signs to watch out for in determining whether your company’s learning culture could use some help being as awesome and strong as it could be. (There are also some tips included for getting there). Leadership, including managers, supervisors, and C-suite staff, set the example for the rest of the company. If leadership doesn’t prioritize training, then no one else will either. People in leadership positions can demonstrate the importance of training by participating themselves and talking about it. They can direct employees to training when they have questions and make sure that employees feel comfortable setting aside work hours for professional development. They can also be sure to remind learners when new training comes out and the importance of continuous improvement. Leadership can emphasize the importance of training in accomplishing company goals during meetings. You can also ask leaders to share stories about how training benefited them and helped them get where they are today. If leadership is engaging in none of these behaviors, the rest of the organization is likely taking their lead and failing to prioritize learning. If you want to change the culture of learning at your company, getting leadership to buy in is an important step. Share with leadership how your training strategy can benefit company growth. Inform them of the resources available to employees and ask them to support you at meetings about training. If people only log into your LMS when they have to complete obligatory compliance training, then it’s likely that they see training purely as a chore. If you see this happening at your company, there’s no way you have a strong learning culture. See if you can’t combat this by finding ways for your employees to see the LMS as a welcoming, fun place where they can find answers to their questions. Have them log in for smaller modules on a regular basis. Start social learning communities where employees can ask others for help understanding something specific. Add a few learning games where they can compete with fellow employees about their knowledge levels. Email them reminders that these resources are available on a regular basis. Modern LMSs have a lot of ways to engage users. Get creative and see if you can’t motivate your learning audience based on the company culture and user needs. Check out our 30 unique ideas on incentivizing learning. One the reasons employees are motivated to learn is it allows them to grow and develop in their career. It’s more difficult to be motivated by this if you don’t see a path forward. Employees need a reason to learn new things and grow. If you develop paths for growth within the company, then it enables employees to see what skills will help them develop professionally. This gives them motivation to learn these skills. If there aren’t specific positions that employees can grow into, you can still develop skills paths in order to hint to employees which skills you would like them to develop for your company’s future. You can also arrange for employees to earn raises based on their growth and contributions. This can give curious learners a path to follow. In a company where people have not previously given training a lot of thought, structure is a useful tool to help make training a habit. Learning paths is one way to provide training structure to start incorporating it into the thoughts of the company. Workers are incredibly busy. There are plenty of people who, if told they should start making time for learning, will look at you like you’re crazy, point to their full calendar, and explode from stress. These employees need to be set up for training success by being permitted to make training a priority, and telling them it’s okay to be patient with getting other things done. Leadership involvement may be crucial in respecting blocked out learning hours or supporting scheduled company time for training. Include training as an option in time-tracking software. Ask what employees learned this week in your team meetings. Send out an email campaign highlighting popular training. Publicly display the training accomplishments of employees. Good Luck Building Up Your Learning Culture! Creating a strong learning culture means everyone has to be on board. Both leadership and employees need to see the value of training. They need to buy in to your strategy, and the above signs are indicators that they aren’t. If you see these things present in your workplace, it could mean you have a weak learning culture. It’s not a death sentence, though. It’s something that can be addressed. Hopefully if your office is struggling with these things, this article is the wakeup call and help you need to get started. Not sure if the quality of your courses aren’t affecting engagement? 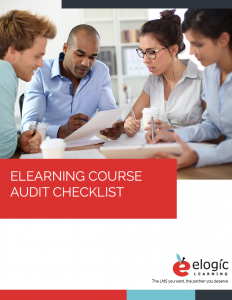 Check out our free course audit checklist to examine factors like content, design, and more.